'Haha awesome. Thanks xD Question...might sound nooby but I have pc parts ...everything all packed in the original box and the mobo and gpu are in anti static bags....but all the boxes are on a couch...is that safe? Also the 4670K BOX with the cpu and cooler in it are on the couch...is that unsafe? Just to agree with the above poster. When the parts are packed, they are packed in a way that is safe for storage. I have NEVER blown a part with static to be honest and have built many a system in carpeted rooms. I have blown voltage regulators/op amps and a rail splitter(other projects) from my own mess ups. I think I will never do it again since I KNOW I messed up. alright thanks. Can you read my specs ? Its the grey quote thing. What do you think for a first PC? All parts came but just not the case....should be up and runnin' in a month or so. Will do, Sir! Just need some CASH XD First I need an HD monitor than an SSD. Seem to be a trend that the large cases are dying out now that you can fit the same quality of a rig in a much smaller case. I am no longer a fan of the huge gaudy cases. IMO they look childish and unprofessional. I quite like my SG05(for such a small case it is quite cool running as well) and FT03 SFF systems. Do not get me wrong they both have limits, but for me they have worked out quite well. If it works for what you need, Thats great, But i feel tiny cases dont feel as high end or of great quality. Is that the case you're using atm or is that just a secondary build? Mirakledba - please don't double post. If you need to quote multiple posts, you can do so by editing your posts with the little icon that has a pen with 3 lines on its left(quick edit). Similarly you could just tag the users name with an @ and attach the username after it(kinda like what you do on twitter). Threads will become uselessly long and cleaning it up takes time...valuable time. FYI everyone the Bitfenix Prodigy isn't anywhere close to a small case. Its size(+height) is that of a Coolermaster N200. xBournex over on OCN has also agreed upon the loosing battle that the Prodigy isn't even close to SFF specs(stated by Intel). Getting a smaller system but with the same horsepower on a compact footing isn't ludicrous. Think of all the space you're saving up on...? @Lutfij Sorry. Ill just add a new answer everytime. Didnt mean to double post. Anyway, About the bitfenix, my point was I dont like SMALL cases and i dont like BIG cases. Fractal R4 is perfect. 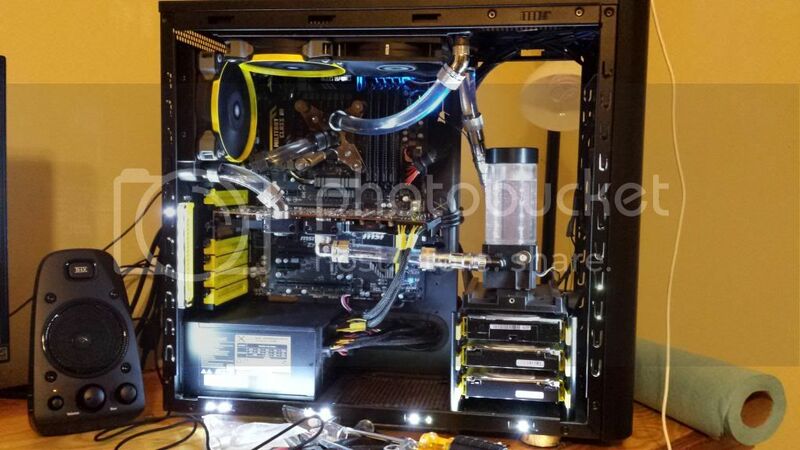 I thought I would post some pics of my son's gaming PC that we built for Christmas. Thanks for the input and advice that made this possible and made for a very happy Christmas for my son. This would not have been possible without the research and advice from tom's hardware forums. chrisinmo2 - Parenting. You're doing it right! Please tell me the model of that monitor as it looks perfect. Its an Asus VE247H. Its a TN panel not IPS because we were concerned with the possible lag time of an IPS panel since he primarily plays FPS games. The speakers are literally worthless as with everything on max you can barely hear them but we planned on adding the external speakers anyway. The price was right on the monitor and we are happy with its performance. The FT03 is my main system and the SG05 is my media center system. Now the SG05 has a notebook drive on the floor a wdc red under the optical drive and the ssd on the side. This maximizes use of the space. This system was all about lower power and a small system. The FT03 system is my main system. I has had some mods done to allow it to work better for me. I am not going to lie after my Define R2(rather large with lots of room) and Antec 900(room and great cooling) this case seems small, but since hard drives had become larger I did not find I needed so much desk space taken by a larger tower. Again both these cases have very strict limits that the 900 and Define do not, but I have been surprised by just how well they have worked out. Brings tight spaces to a new level. I think I got lucky since this cpu runs quite cool and undervolts well. That reminds me of the NCase. Lots of new community created cases now. I just **** my pants. Ty for link. I bought 4 FYI + its limited edition so I would think more than 10 times before saying Meh + You're welcome there! That card would fit in an FT03, but with the cases not so good air flow I would never recommend it. A performance card like that needs room for sure. I had some slight mods to help live with lower air flow. While all in ones are considered to be cheap toys, they do work great on video cards(The H80i was on sale for a very good price too and cleared out lots of room in this case.). I wish I had room for 2 H80i's(without a rear external fan, but it would have have been worth it) because the pump on it makes no sound while the zalman lq310 requires substantial undervolting. Nukemaster - Yeah You see, I dont like builds that are all cramped up like in the picture you put. Too much going on. Only concerned about the system doing what it has to and not being too loud or hot. That is something SFF could not do without some of the more power friendly parts we now have. Everyone has a different need from a system(space/power/performance/looks/ect). As I had said above, I would NEVER recommend my case(not enough air flow for your setup to run at cooler temperatures offered by its cooler) for your system anyway. I like my Define R2 system as well, more quiet with the right parts, but it was just too big for the place my case is now sitting. It is still in use as another system. I love a small build with tons of things stuffed in. I used to have an SLI setup in a microATX case. It was awesome, and heat wasn't really even an issue. Nuke, you build is absolutely awesome. 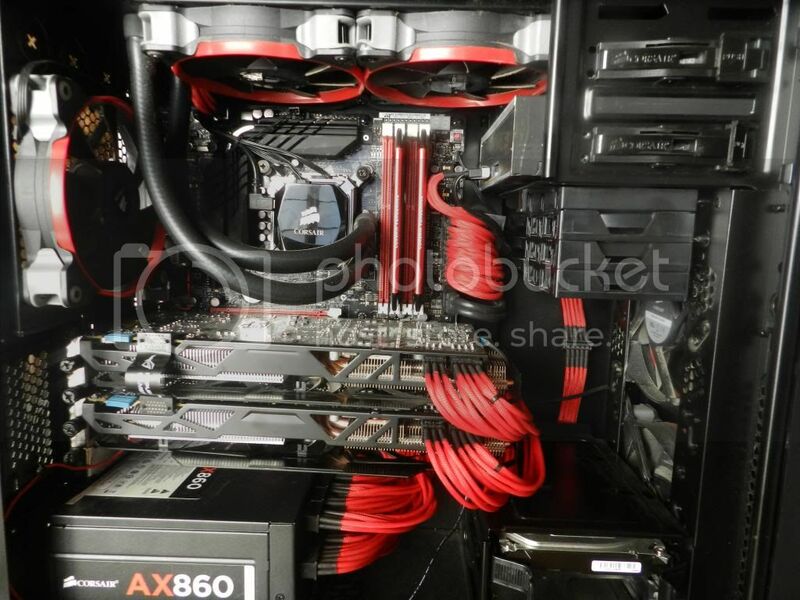 Yeah Nukemaster - (again with cablemanagement rant) your cables look stunning in there! You sure you didn't touch them up before posting a pic round here? I can vouch for that case as I usually hand out on the FT03 case owners club on OCN to study the case internals in hopes my client might move for a more vertical rig compared to traditional mid-tower designs. However the size has had me fooled on a couple of occasions as some have their's watercooled with QDC's/external rad mounts and/or internal rad with no heed to those silly temps from a single 120 rad. I noticed you're recycling your old squirrel cage blower fan...might want to look into NZXT's GPU 10. Custom bracket/screws holding your zalman on that GU or regular DIY w/ zipties method? I actually have the Sigma_Cool bracket on it along with half an old heatsink bolted(screwed to be more accurate) to the stock cooling plate to help with vrm cooling since the stick plate gets very hot without the no longer fitting shroud. I have tried to leave as much of the stock parts on the board in case of future RMA(the first card actually would boost into instability[right from the start] and that was with stock cooling. this one boosts even farther but so far is stable[with either cooler].). Kind of leaves me wanting it as RMA friendly as it can be in case. Part of me wants to just rip off the stock plate(would need to get some new thermal pads in case the ones on the card get damaged) remove the blower and fit the largest old cpu cooler I can to the stock vrm plate(screw it in from the back with the stock fans 3 holes). With enough a fan would not even be needed. The reason behind this is because some users report great gpu temps, but bad vrm temps leading to lower boost clocks. The stock plate has a fair bit of mass when you compare it to a small heatsink per mosfet. My system would be MUCH nicer with an actual proper liquid loop. Maybe a future project. Dealing with cables in this case is about sticking as many in the back as you can, but it could look much nicer. Some of those ocn ones are otherworldly. I got bored and impatient waiting for all the appropriate fittings to arrive. I used a hodge-podge of various 3/4" OD compressions to get a functional watercooling setup. I placed an order for more shiny BP compressions. Also I have two more rads to add to the loop!! I need to get more SP120 fans as well.